Telescopes can provide you with hours of fun and are a great way to introduce children to the universe around us and to the sciences. That’s why we recently published an introductory guide to astronomy, specifically for kids. However, with so many telescopes to choose from, it can be difficult to find the right one that suits your budget and expectations. Explore our simplified telescope guide below, learn the basics, save time and let us help you choose the best telescope. While there are thousands of different telescopes to choose from, for beginners, you can narrow the choice down to just three types. Each has its own pros and cons and of course, price points. A reflector telescope is the most popular option and uses several mirrors to divert the light into an eyepiece. This type of telescope is compact and offers the best value for your money and isn’t as bulky as other types. Pros: This telescope is lightweight, affordable, good for faint objects and produces good quality images. Cons: Requires more maintenance and doesn’t work well for objects on the earth. A refractor is the simplest of all telescopes and is shaped like a long tube with lenses that concentrate and direct the light towards the eyepiece. This design was used by Galileo and is the earliest type of optical telescope. Pros: Sturdy, long lasting and suitable for earth-based objects. The sealed unit requires no maintenance. Cons: Often very heavy and with a long length, can be bulky to transport. Not the best telescope for far away faint objects. A compound telescope utilises both lenses and mirrors and is a hybrid of reflector and refractor telescopes. This type of telescope is perfect for both near and far objects and is often used in astrophotography. Pros: Great for viewing objects on earth such as birds but also faint, distant stars and planets. Requires little maintenance. Cons: Often large and bulky and almost always more expensive. Which Telescope is Best For You? Which option is best for beginners? Refractor or reflector. The best for image quality? Compound or reflector. What is the best option for travelling and ruggedness? Refractor. Best telescope for astrophotography? Compound. The best option for viewing far away and distant objects? Compound or reflector. Should I consider a computerised telescope with automatic alignment? Yes, we think these are a great way to automatically find objects in the sky. Rather than relying on consumer reviews and promotional material, we suggest you look in detail at the specifications of each telescope on your shortlist. In general, the four points below will determine how good your telescope is at locating and resolving images both near and far. For a more detailed look at how telescopes work check out this guide to telescope features. Aperture is the size of the lens or main mirror and in general, the bigger the better. A larger aperture will allow more light into the telescope for clear and more detailed images. This is an important factor but not the only spec you should look at, you need a telescope that can process that light correctly. Magnification determines how far you can see and how large distant objects will appear to you. This isn’t the most important factor, if you have a tiny aperture and very little light coming into the telescope, it won’t matter how strong the magnification is. Computerisation is used by many telescopes to automatically locate and track objects in the sky, often using a database and connection to a satellite for time/date/gps data – don’t forget that as the earth rotates, you may lose your fix on distant objects so computerisation is a great, if somewhat expensive, option. Focal Length is a key part of every telescope and in general, the longer the length, the better! Some modern telescopes use optical tricks to fit a longer focal length into a smaller compact tube. For best results, choose a telescope with a large aperture and a long focal length. Below you’ll find our top 8 telescopes for 2018/19. All of these products are suitable for beginners and you’ll find several at the lower end of the price band too. 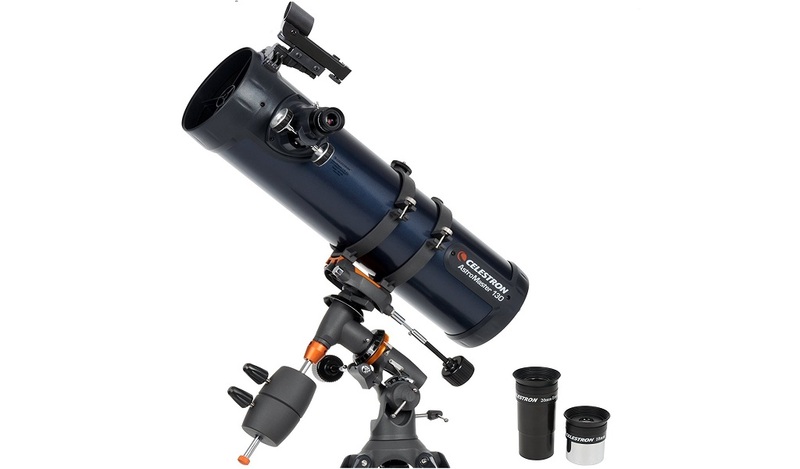 This telescope in Celestron’s classical orange-tube design offers their best optics in combination with the most advanced technological features to ensure that beginners and veterans enjoy their star watching. The NexStar 5 SE which sells just under £730 with a free delivery offer is the perfect choice for anyone who wants to enjoy the latest computerised abilities of the telescope at a reasonable price. This telescope will allow the viewing of the planets, the moon and deep sky objects in great clarity. The telescope with its 125mm aperture ensures optimum light gathering to ensure observation of the solar system greats like the rings around Saturn, craters on the Moon and the clouds around Jupiter. The focal length is 1250mm with a f/10 focal ratio. The Schmidt-Cassegrain optical design of the telescope ensures good observation and the ability to photograph the celestial bodies. The telescope has a control feature for SLR cameras that allows the remote taking of timed exposures. The tripod also has a built-in wedge that makes long exposure tracking possible. The telescope is very portable and has a total weight of under 8kg, the setup is easy and fasts with the single fork mount and the steel tripod that offers a sturdy and stable platform. The telescope offers all the advanced features of the GoTo telescopes that includes a database of more than 40,000 objects which can be automatically located and tracked. The NexStar and hand control allows for locating objects or taking a Sky Tour. The SkyAlign functions ensure easy and fast aligning of the telescope. The telescope is compatible with all the other accessories like StarSense Auto Align for automatic alignment and SkySync that provides GPS coordinates. 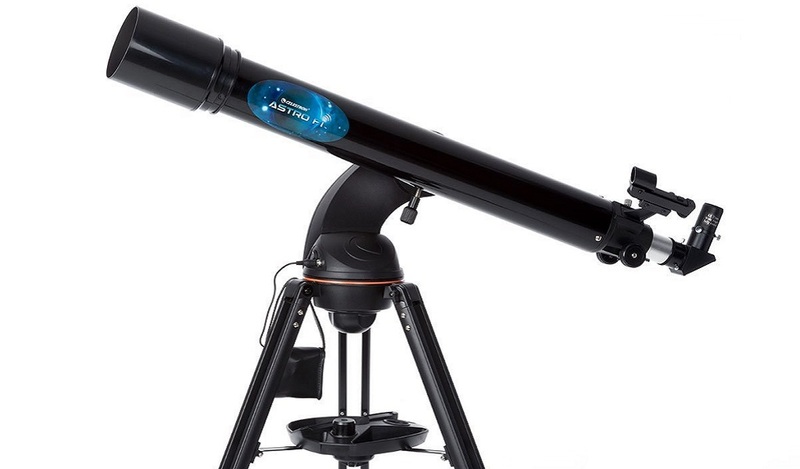 This telescope which comes in under £160 with free delivery offers the more advanced beginner the ideal option to start their astronomy viewing with. The telescope with its erect image optics offers dual-purpose use with its ability to be used for celestial and terrestrial viewing. The telescope forms part of the Celestron AstroMaster series which is known for their ability to give accurate views of land and sky. The specifications of the telescope are the following: The telescope has a 130mm aperture and optical tube length of 610mm. The telescope comes with a “StarPointer” that is permanently attached to the scope. The scope uses a steel tripod with 1.25” steel legs that ensure stability when used. There are no tools needed to assemble the scope and it fits with a dovetail attachment with quick-release capability. The telescope weighs 12 kg and comes with an accessory tray for convenient storage of items. The mount used is a German Equatorial mount with setting circles which helps to achieve accuracy when locating and tracking objects in the sky. 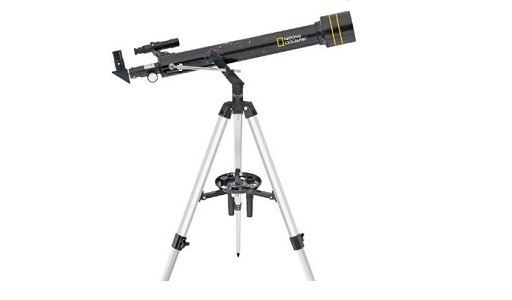 The scope is ideal for the beginner astronomer with the added advantage of being able to use the telescope for both celestial and terrestrial observation. The coated glass optics ensure crisp and bright images, the Moon and planets can be viewed in nice detail with Saturnus and the rings surrounding it clearly visible. The telescope comes with the SkyX – First Light Edition software with printable maps and a large database. 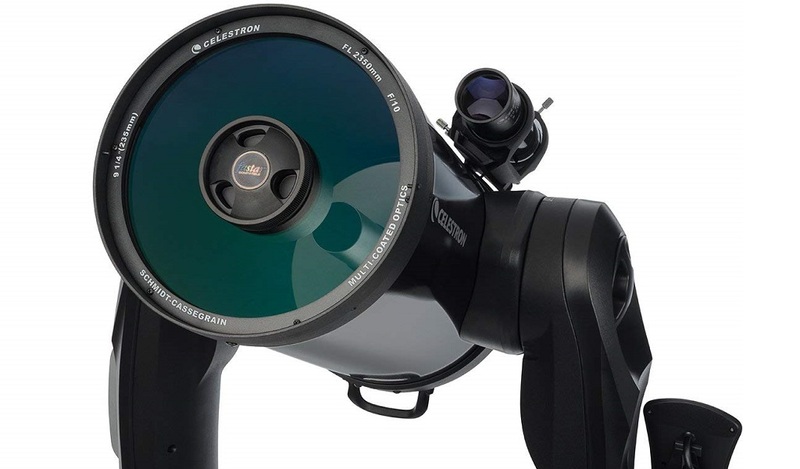 The Orion Starblast 6i IntelliScope is reminiscent of the Dobsonian mounts and offers a great tabletop design. 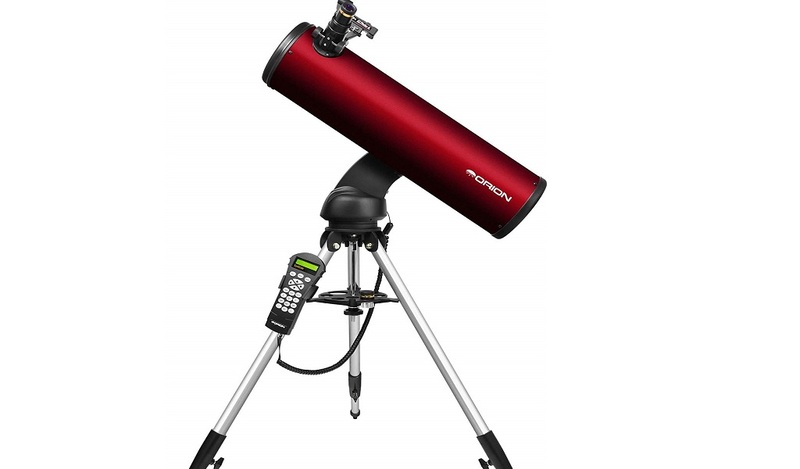 The telescope comes in at just under £510 to which a £130 UK delivery cost must be added. The aperture optics is 125mm and it has a focal length of 750mm and a focal ratio of f/5.0 and is ready to be used with the Orion IntelliScope technology that allows the pushbutton location of more than 14,000 celestial objects with the Computerized Object Locator although this function is not motorised. It enables great views of not only the moon and planets but also the brighter objects in deep space. The alignment can be a bit tricky initially. The telescope weighs just under 11kg which makes it portable and the fully assembled table top base makes it easy to use on any sturdy flat surface. It is truly portable and can be easily set up, the material used in construction is solid and ensures smooth operation. The accessories include 2 eyepieces of 25mm and 10mm, EZ Finder II aiming device, rack for eyepieces, IntelliScope Computerized Object Locator and Starry Night software. The Orion StarBlast telescope is one of the best reflector telescopes available in this price bracket and it offers a one-year limited guarantee. This telescope which comes in under £380 which includes free delivery is the first one on the list which can be fully controlled via Wi-Fi using your smartphone or tablet. This feature changes using the telescope from being a manual operation to a wireless control operation. The control is done using the Sky Portal app from Celestron which can be used for any Android smartphone as well as iPhone or iPad mobile devices. The telescope produces its own wireless connection to enable communication where no networks or Wi-Fi are available. Apart from the Wi-Fi control ability the telescope specifications are impressive and offer the same capabilities as any other telescope: The optics includes a fully coated optic refractor of 90mm and a focal length of 910mm with a f/10.1 ratio. There is a Red Dot, StarPointer finderscope fitted to the telescope and two Kellner eyepieces of 10mm and 25mm and a battery pack. The magnifications of the two lenses are 36x and 91x. The range of magnification is from a low of 13x to a maximum of 213x. The tripod is fitted with an accessory tray that house the two lenses, other accessories and a designated area for a tablet or phone. The telescope weighs 10,8kg when fully assembled. The telescope changes the way we view the night sky, it is easy to set up with the Sky Align technology from Celestron, which entails that the user centres any three bright objects in the eyepiece whereafter the position of the telescope is calculated. You can also use your smartphone to indicate to the telescope what you want to view. The telescope offers excellent views in a great clarity of whatever object you want to observe. This German telescope which comes in under £224 with free delivery, offer GSkyer Infinity’s more than 20 years of experience in the field of optical technology. 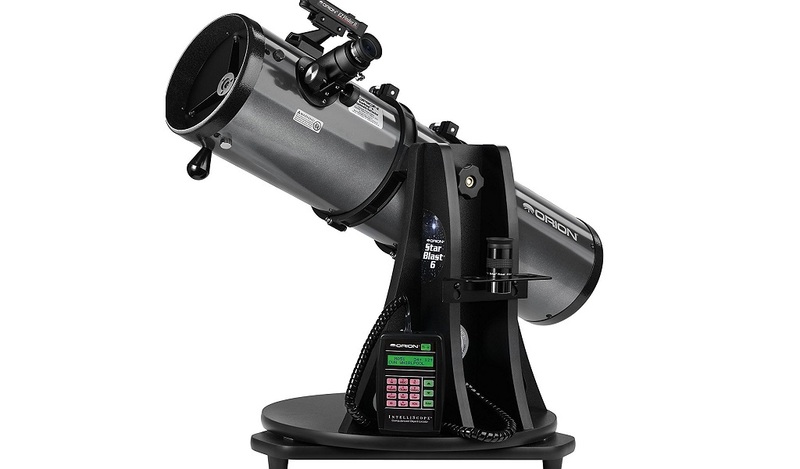 The telescope is a high entry level scope that is affordable and offers a number of extra features like “The Sky” astronomy and an image prism. The telescope form part of a range of telescopes produced by GSkyer for different purposes. The telescope offers an impressive number of specifications: The focal length is 600mm with an aperture of 90mm and a F/6.7 ratio. The telescope uses an Altazimuth mount that is equipped for slow motion with a controller. There is also an adapter for the mounting of a smartphone and Bluetooth remote for a camera to be used when viewing the planets or lunar phases. There is a finder scope attached to the telescope and the three eyepieces range from 5mm through 10mm to a maximum of 25mm and offers magnifications from 24x to a maximum of 360x. 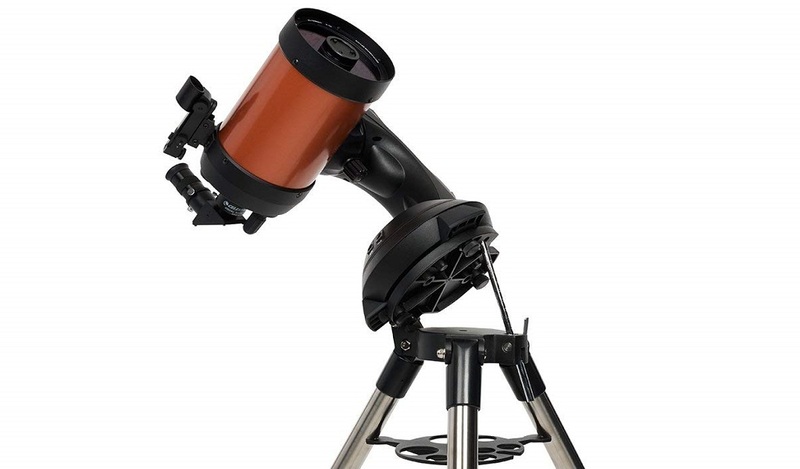 The telescope that weighs 8.16 kg is easy to assemble and use a stainless steel tripod that is equipped with a very handy tray for accessories and the Altazimuth mount ensures smooth movement. The GSkyer telescope comes with a 1-year limited warranty and the glass lens used is multi-coated with antireflection film for crisp and clear views. This telescope is the least expensive telescope on the list but that doesn’t imply that it is a cheap telescope with no features. The telescope comes in under £90 and includes free delivery. 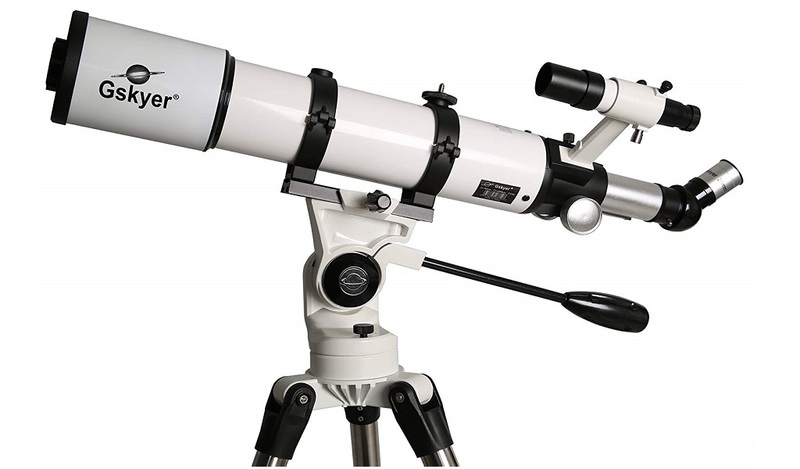 It is an ideal telescope to be used as an entry level for persons interested in astronomy but who might not know if they will devote more time than an occasional glance at the night skies. It is also ideal for introducing children to wonder of astronomy. The specifications of the telescope are the following: The telescope uses an achromatic refractor 60mm lens, a 60mm aperture and has a 700mm focal length. The three eyepieces of 4mm, 12,5mm and 20mm allow a range of magnification from 35x up to 525x but the most ideal is recommended magnification is 120x. There is an erecting or finder scope of 5×24 with an erecting lens of 1,5x. The telescope fits onto an aluminium tripod which is very easy to assemble and handle. The telescope uses an Altazimuth mount which is ideal for viewing and smooth movement of the telescope. The telescope is easily erected and no tools are needed which makes it ideal for casual observations and is transportable. This makes it ideal to take along for that weekend camping trip. The bag in which it comes keeps everything together and there is a manual included for easy reference. The telescope is suitable for old and young, ideal gift from parents for a child who shows interest in astronomy and the adult who only want to use it occasionally to look into the sky. The telescope offers a complete package for anyone who wants to start cultivating their interest in astronomy. The motorized StarSeeker telescope combines GoTo technology and excellent optical ability in one telescope at a price of under £710 plus a UK Delivery cost of just under £73 that must be added. The Orion StarSeeker boasts with an aperture of 127mm and a focal length of 1540mm with a focal ratio of f/12.1 that allows excellent views of the celestial objects. The GoTo database offers in excess of 42,000 objects and can also be set in Tour mode to allow effortless locating and viewing. The StarSeeker telescope is easily aligned with its two- star alignment system. After alignment, the telescope can be aimed manually without losing its GoTo alignment with its dual optical encoders. The telescope can also be moved electronically with the GoTo hand controller. The StarSeeker will automatically locate and track any object after its selection. The GoTo mount and the single-arm Altazimuth allows 360 degrees azimuth motion and 90 degrees altitude motion. The telescope is easily attached using the quick release saddle with its dove-tail design. A sturdy steel tripod with a spreader plate that doubles as accessory holder provides stability for the telescope with its weight of just over 10kg. The accessories include a GoTo hand controller, two eyepieces of 23mm and 10mm which offers 67x and 154x magnification respectively, EZ Finder II sight and more. The most expensive telescope on our list which sells at just under £2400 with free delivery included is the most advanced telescope on our list available for advanced beginners and amateur astronomers, the price provides value for money for the beginner that is serious about astronomy. The telescope offers a number of impressive specifications that include a 235mm Aperture and a focal length of 2350mm with a f/10 focal ratio. The 40mm eyepiece offers a 59x magnification, the lowest magnification is 34x and the maximum 555x magnification. The lens coating is the Starbright XLT coating from Celestron to ensure absolute superior quality. There is a 9×50 finder scope that enables accuracy when searching for objects. The telescope mount is an Altazimuth dual fork arm that is totally computerised. The computer weighs just under 28kg and fits on a heavy duty stainless steel tripod that ensures stability and allows for easy fitting and assembly. There is also a handy accessory tray. The star diagonal ensures more comfortable viewing when objects are located high above in the night sky. There is also a convenient holder for the NexRemote control that enables hands-free viewing of information. The telescope comes with an internal GPS which downloads data from satellites orbiting the earth and accurately determines the exact position. The most impressive is the SkyAlign alignment technology used, that enables fast and easy alignment of the telescope where after the Celestron NexStar software technology will replicate the night sky and determine the position of every planet, object or star. The hand control allows access to the more than 40,000 objects in the Celestial Objects Database. The telescope can then be instructed to identify the different objects in the sky so that it can be viewed. The Celestron CPC 925 GPS telescope which is fully motorised with the computer software technology completely revolutionised the astronomy hobby and offer the latest technology at an affordable price.